Watervilla, 4-room villa 100 m2 on 2 levels. Comfortable and modern furnishings: living/dining room with dining table, separate WC, international TV channels, flat screen and wood-burning stove. Exit to the terrace. Open kitchen (4 ceramic glass hob hotplates, freezer, electric coffee machine, combination microwave). On the lower ground floor: 1 room with 1 double bed. 2 rooms, each room with 2 beds. Shower/WC. Floor heating. Terrace furniture. Beautiful panoramic view of the lake. Facilities: washing machine, dryer. Internet (WiFi, free). Please note: non-smoking house. Private mooring. 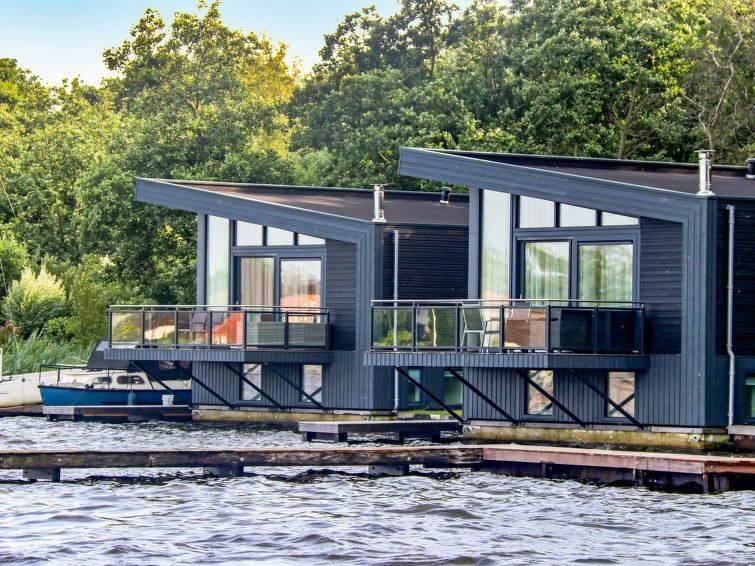 Eelderwolde 8 km from Groningen: Modern, comfortable villa Paterswoldersemeer, built in 2016. Outside the resort, 2.5 km from the centre of Eelderwolde, in a quiet position, on the lake. Central parking spaces. Supermarket 1 km, restaurant 500 m, bus stop 200 m, railway station 5 km, sandy beach 500 m, outdoor swimming pool 4 km. Sports harbour 2.6 km, marina 1.4 km, golf course 4.5 km, surf school 2.6 km, sailing school 1.4 km. Nearby attractions: Museaum de Buitenplaats 4 km, Martiniplaza 6 km, Groninger Museaum 7 km, Prinsenhof Gardens 8 km, Sprookjeshof Zuidlaren 15 km, Landgoed Nienoord 19 km. Well-known lakes can easily be reached: Friescheveen 1.8 km, Hoornse Plas 2.5 km. Hiking paths: 't Elsburger Onland 100 m, Park 1 km, Hoogzit 2.2 km. Please note: not suitable for children under 6 years. Groups of teenagers on request only. Private mooring. Airfield 10 km from the property. The photograph shows a typical example. There are more similar properties for rent in this same residence. Workmen not allowed. The house can be reached via a narrow path.